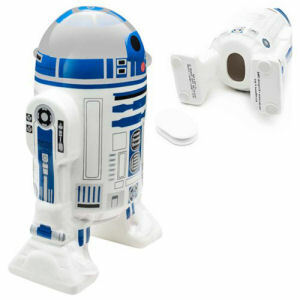 We have Just Sold out of Star Wars R2-D2 Ceramic Molded Bank. This Item is unavailable at present. From the Star Wars collection by Zak Designs. Star Wars R2-D2 Ceramic Molded Bank. Ceramic Molded Bank measures about 7 inches tall and comes packaged in a closed box. Hand wash only. Not dishwasher safe. Ages 3 and up. Zak Designs Star Wars Banks shipping from Canada. No Surprise Border fees or Customs!